Wilson attends a half day preschool program that follows the public school system’s calendar, so his year ended two weeks before Walker was born and the new year just started in late August. He LOVES school, but the first couple weeks he experienced some separation anxiety that was a little out of character for him. He had gotten used to having my total attention for three months while I was on maternity leave and I think he was a little jealous that Walker got to stay home with me and he had to go to school. He’s a smart little boy and it only took him a week to figure out that if he told his teacher he was sick, they would call me to come pick him up. To help him get through the adjustment, I tried to come up with some fun activities we could do together after school. If your preschooler is like mine, they love anything messy and dirty. One afternoon, I went straight to one of our online courses and found the recipe for homemade slime. Simply mix equal parts cornstarch and water, add a couple drops of food coloring, and you have slime. 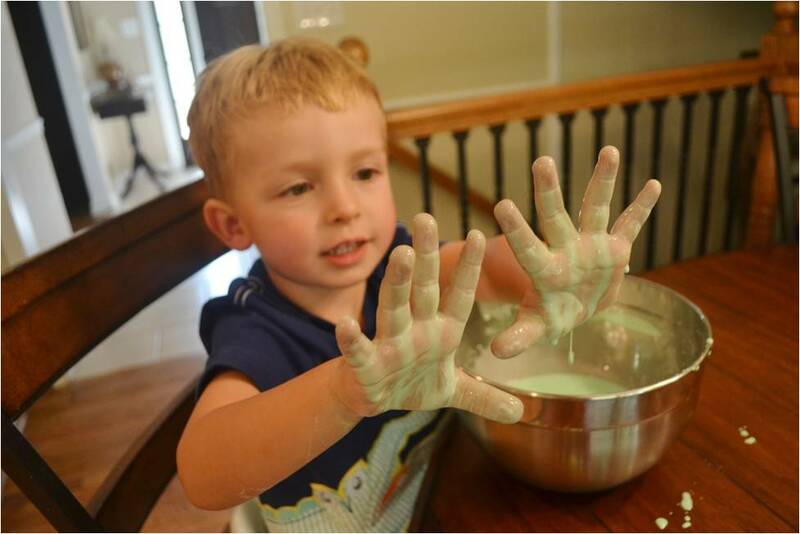 You will have a huge mess to clean up after and your child's hands may be slightly stained by the food coloring, but they will have lots of fun!